ThredUp is an online consignment store for children’s clothing and women’s clothing and handbags. Right now they are offering a free $20 credit when you sign up here. The credit does not apply towards shipping costs, but you can still get some incredible deals! 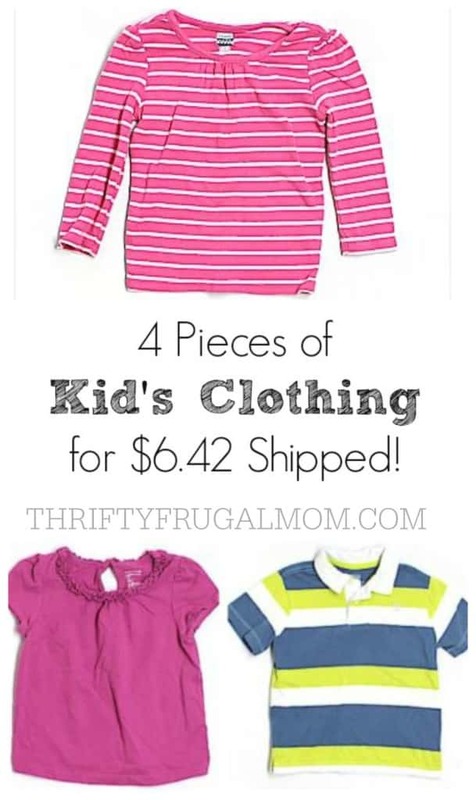 Here is one scenario that will get you 4 items of kid’s clothing for just $1.61 each, shipping included! 1. Sign up for a ThredUp account here. It was so nice to not have to leave my house to shop too, which also meant that I saved time and gas. Oh and another fun thing? My orders came wrapped up like a gift inside…which made them seem even more special! Just ordered a cute fall outfit for my youngest, Gap jeans and an Orient Expressed blouse for just under $9 including shipping! I also ordered a free bag so I can send some things to them : ) Thank you for letting us know about the promotion! Awesome, Wendy! So glad you were able to get a great deal. I don't post a lot of deals on my blog, but something like this is just too good to not pass on. :) Hope you can do well on the clothing you send in!